It would be more than difficult to pinpoint the exact boundary between Obama’s economy and Trump’s economy. These governance have had ups and downs and the decisions made by the 44th president have surely made impacts on the current American mercantile. Also, the Congressional Budget Office (CBO) forecasts reflected an increasing trend for both administrations. Obama’s leadership started in 2009 while that of Trump’s was in 2017. 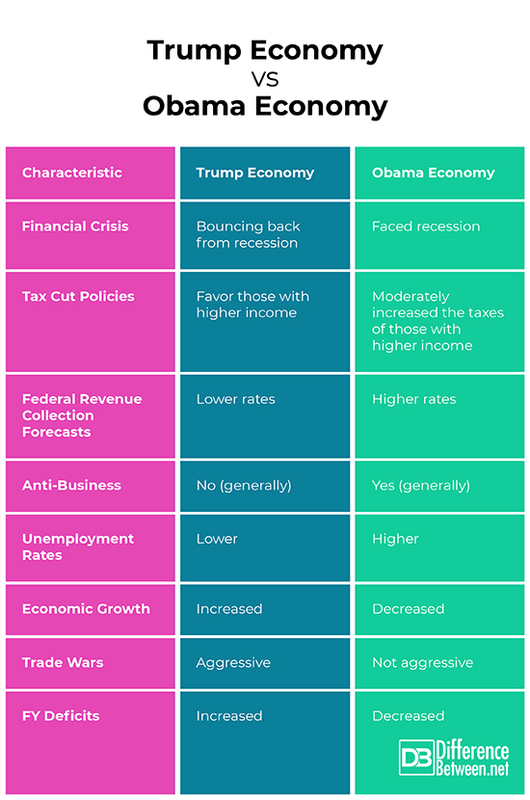 Generally, the previous administration’s economic policy centered on decreasing federal budget deficit and income disparity as well as moderately increasing the tax of those with higher revenues. On the other hand, Trump’s pledges during his campaign included dissolving the Dodd-Frank Wall Street Reform and Consumer Protection Act, reforming individual and corporate taxes, and enhancing trade protection. The subsequent discussions tackle other distinctions. This amended the 1986 Internal Revenue Code by decreasing personal and business taxes. -A reduction was made in healthcare ($2 trillion), non-defense discretionary ($1.5 trillion), corporate and income tax of those with higher revenues ($1 trillion). -An increase was allotted for infrastructure projects ($200 billion). The FY 2018 deficit had an estimated 60-percent-increase as compared to the projection of the CBO in 2017. In 2009, the ARRA was implemented as a stimulus program which involved tax deductions. It also included the private sectors’ creation of various jobs. In 2012, the ATRA was passed which extended tax cuts to those whose income were less than $400,000 ($450 for married tax payers). The yearly federal deficit decreased by 58 percent but the national debt increased by 88 percent. Obama’s administration started in the throes of the recession period. Thus, one of his biggest priorities during the initial years of his term was to address the financial crisis which began in 2007. On the other hand, the economy has already largely recovered during Trump’s administration which is evidenced by statistics on economic growth and decreased unemployment rates. Trump’s policies on tax cuts are generally viewed to favor citizens with higher incomes while those of Obama were meant to lessen income inequality by implementing higher taxes to those with equally bigger revenues. The Obama baseline “CBO January 2017” forecast started at 3,600 which steadily increased to around 4,700 billion. As for Trump’s “2018 forecast”, it only started at around 3,350 billion which steadily increased to around 4, 625 billion. Trump is generally perceived to favor businesses as reflected from his tax policies which leaned towards favoring high-revenue companies and individuals. Also, small-scale businesses are presently having very high hopes. Moreover, the current president is known to have much background in the corporate world. On the contrary, Obama is mostly viewed as anti-business which is also apparent from his policies on moderately increasing the taxes of those with higher income to fund his health-care program. Around 3.6 million jobs were created during Trump’s governance. Interestingly, survey shows that the unemployment rates for Latinos, African-Americans, and women are currently increasing at around 0.3 percent. However, these rates hardly increased during the Obama administration. Economic growth decreased by about 0.5 percent in the final quarter of the previous administration as evidenced by the 2.3 percent growth in the second quarter of 2016 to only 1.8 percent in the last quarter. On the other hand, the present administration is charting an average economic growth of 2.9 percent and it is projected to increase at the end of 2018. Trump has been known to initiate trade wars with several companies such as the Trans-Pacific partnership and with several countries like China and Mexico. On the contrary, such aggressive approach was not associated with Obama’s leadership. The FY 2018 deficit under Trump’s watch had an estimated 60-percent-increase as compared to the projection of the CBO in 2017. Contrariwise, that of Obama’s decreased by 58 percent but the national debt increased by 88 percent. The exact boundary between Obama’s and Trump’s economy is difficult to specify. The Congressional Budget Office (CBO) forecasts reflected an increasing trend for both administrations. Obama’s leadership started in 2009 while that of Trump’s was in 2017. Trump’s economic policy is generally associated with the Tax Cuts and Jobs Act of 2017 while a couple of Obama’s are the American Recovery and Reinvestment Act and the American Taxpayer Relief Act. Obama’s administration faced the throes of the great recession while that of Trump’s is bouncing back from it. The tax policies of Trump favor those with higher revenues while that of Obama’s impose moderately higher taxes for those with high income. As compared to Trump’s administration, the Federal Revenue Collection forecasts for Obama’s administration are higher. Unlike Trump, Obama is generally perceived to be “anti-business”. The unemployment rates are lower during Trump’s presidency. 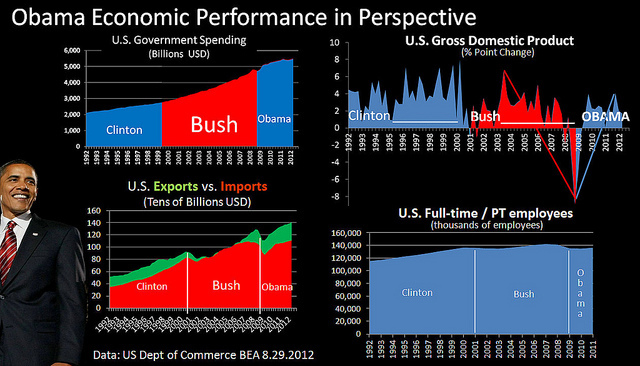 There is a higher average economic growth in the current administration. As compared to Obama, the attitude of Trump on trade wars is more aggressive. gene balinggan. "Difference Between Trump Economy and Obama Economy." DifferenceBetween.net. 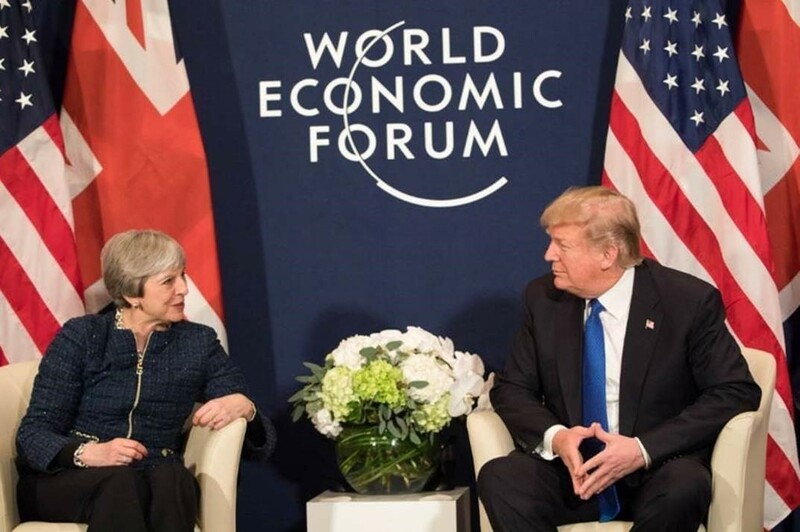 February 11, 2019 < http://www.differencebetween.net/miscellaneous/politics/difference-between-trump-economy-and-obama-economy/ >. Moore, Stephen and Laffer, Arthur. Trumpnomics: Inside the America First Plan to Revive Our Economy. All Points Books, 2018. Rasmus, Jack. Obama’s Economy: Recovery for the Few. New York, NY: Palgrave Macmillan, 2012. Print.